← Damon is the proud papa! 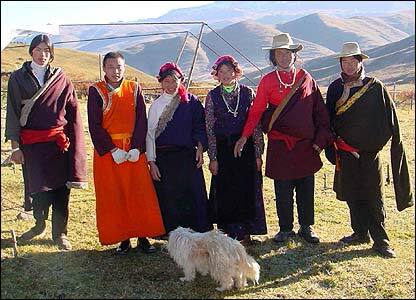 Jigme and seven of his relatives, including his wife, three sons and a daughter – pictured here – sleep in his yak-hair tent.”At night, right before bed, we howl into the dark to remind would-be thieves, wolves and local hungry ghosts to stay away from our herds,” Jigme says. Kathy, where are you and how do you find these things? I can’t wait to read this…Where did this picture come from? I have one of Debby’s dogs–Sweet Pete! Kathy: Is Pete a Fleetfire or Gompa? I am very much like you, always looking for the roots of the Gompas….I recall from one of your old posts that you also have an affinity with Native American Cultures.. me too, specially the Apaches….and that picture of those Tibetan nomads really remind me of an old tribe….I think a friend told me the Hopi language is very similar to that of the Bon people….many parallels, huh? I just had a pair of boots made by an old bootmaker in Hudson, Massachusetts that are modeled on Indian boots from the 1800’s and they look similar to those child’s boots from the Bhutan….Send a picture of your dogs and you to the blog!!!!!!. Gail: Petey is Fleetfire–sent a picture to Debby rather than the blog! Maybe I will see you at the open house and we can share stories on Tibet, apsos, and Native Americans!